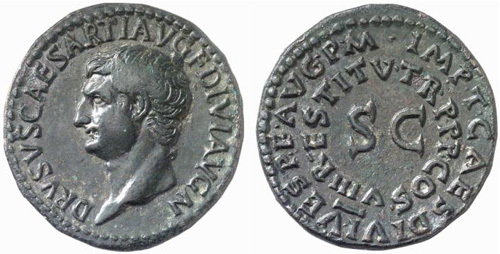 Drusus Caesar, was the son of the Emperor Tiberius by his first wife Vipsania. He married Livia, the sister of Germanicus. After the death of Augustus, A.D. 14, he was sent into Pannonia to quell the mutiny of the legions. 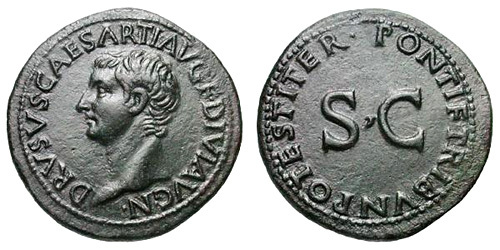 Obverse: DRVSVS CAESAR TI AVG F DIVI AVG N, Drusus head, bare, left. Reverse: PONTIF TRIBVN POTEST ITER around large S C.
Reverse: IMP T CAES DIVI VESP F AVG REST round edge : S C large, in centre. Reverse: IMP T CAES DIVI VESP F AVG P M round edge : TR P P P COS VIII RESTITV in inner circle : S C, large, in centre.